CHRISTMAS IS COMING! Once November rolls around, I can’t help but want to jump straight into the Christmas decorating. Instead of decorating “spooky” for Halloween, we stick with festive fall pumpkins that double for both Halloween and Thanksgiving. That way we don’t have to decorate twice! I had to move said pumpkins out of the way and pull out my JOY wreath so I could snap a few photos of our new DIY lighted PVC candy canes! How festive does this look in our front yard! 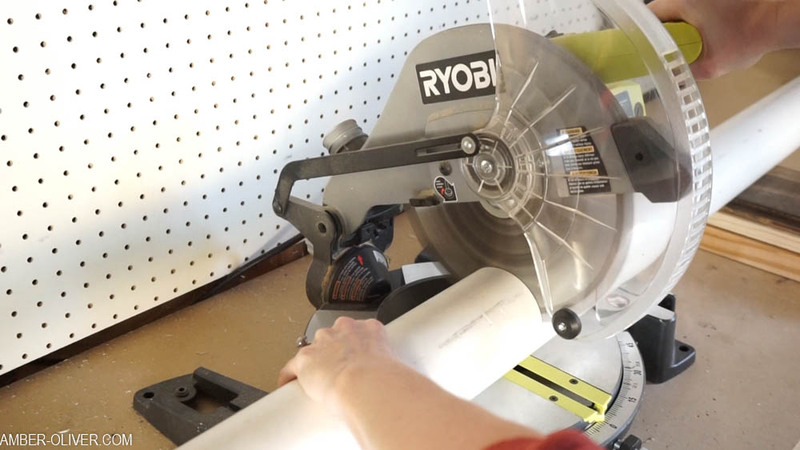 I used a miter saw to make the 4 cuts to create this project, but you could also use a hand saw if that’s all you have! Since it’s so few cuts, it shouldn’t take you too long to knock this project out! 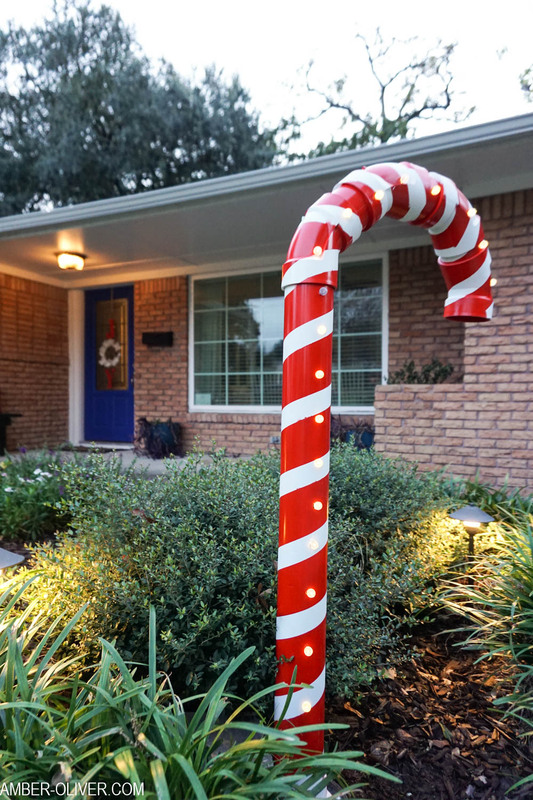 How to Make DIY Lighted PVC Candy Canes - a creative way to make your own holiday yard decor with ordinary PVC pipe from the hardware store! Next, cut three 3 inch sections. 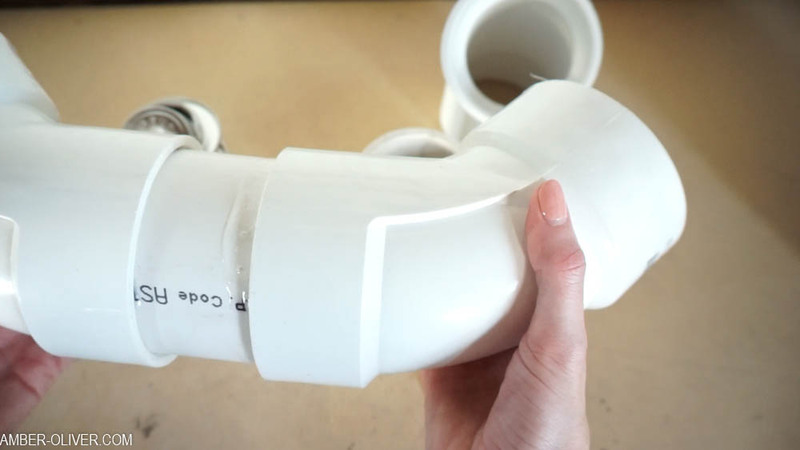 Glue the elbow joints together with the 3 inch sections. Note: DO NOT CONNECT THE TOP OF THE CANDY CANE TO THE BOTTOM. 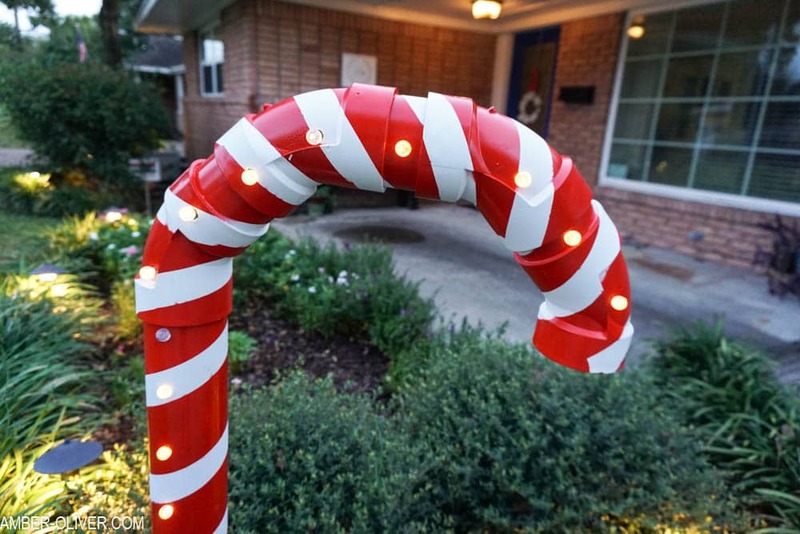 Drill holes (large enough for your lights) down the front of the candy cane. Also make sure they are spaced appropriately for your lights. Once you've drilled the holes, add a coat of white paint and allow to dry. 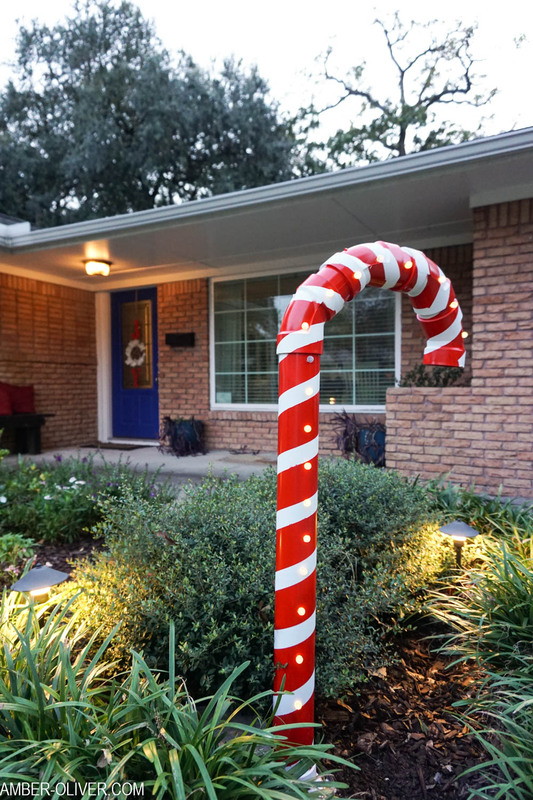 After the paint dries, use painters tape to make stripes on your pvc candy cane. Finally, add a coat of red spray paint! After the paint is dry, insert the lights through the holes you drilled. 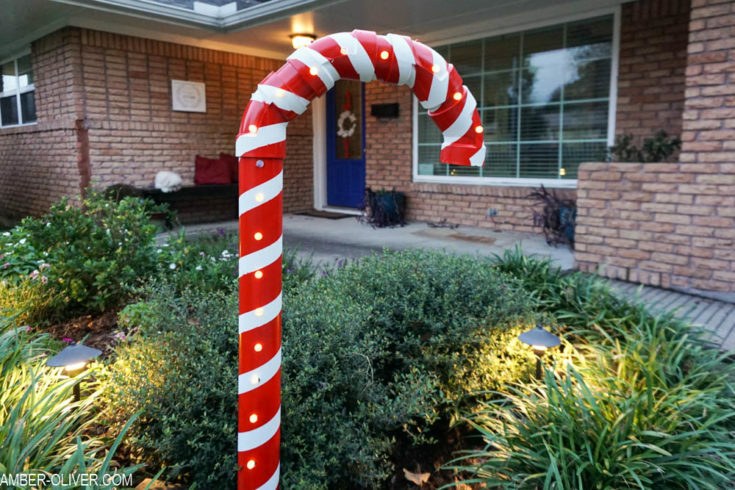 Before you put the pieces of your PVC candy cane together, insert rocks or sandbags to help add weight to the base. Insert candy candy cane into the flange to help stabilize the base! We filled our candy cane with rocks and also used a flat brick in the garden to help hold it up. 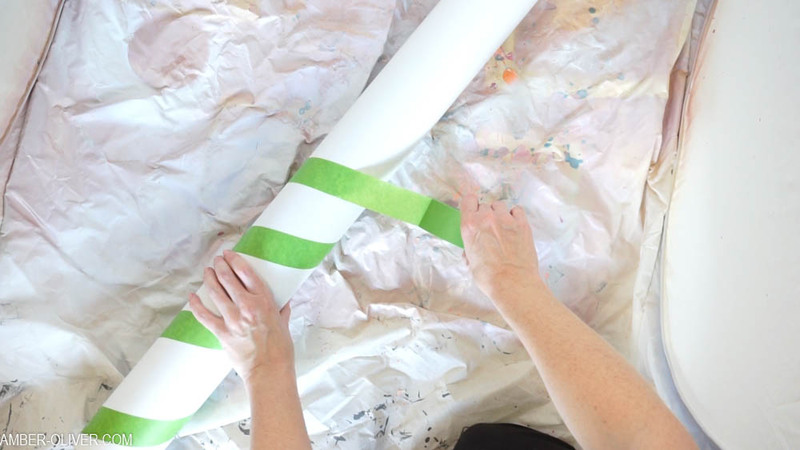 It doesn't matter if your cuts aren't perfect or smooth - they'll be hidden. 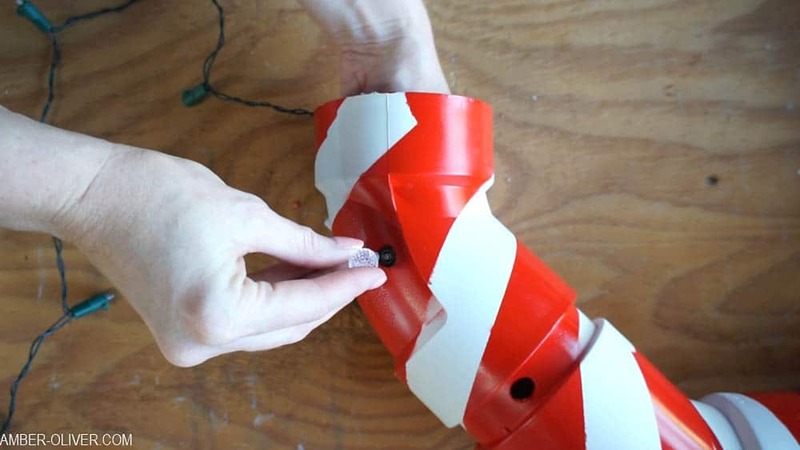 The hardest part of making these DIY lighted PVC candy canes is inserting the lights. 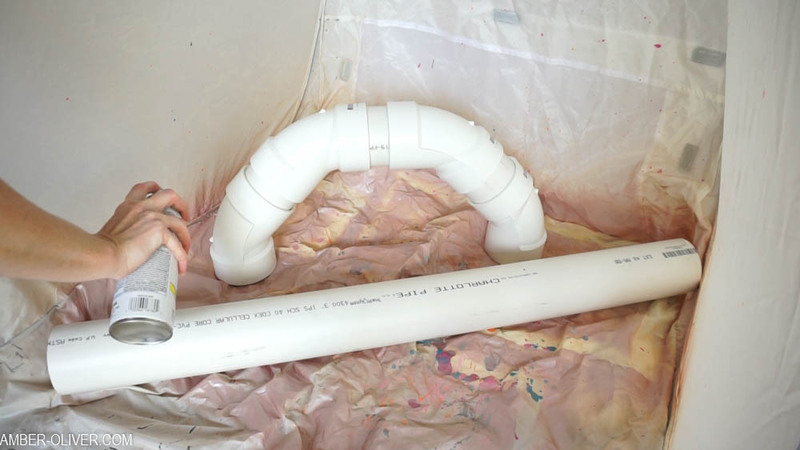 You can use whatever size PVC pipe you’d like, but even with my little arms, I had trouble reaching up into the pipe. I actually had a minor freak out when I thought my arm was stuck!! Luckily it came out just fine, but a 4 inch pipe would have given a little extra space and a little less stress!